In 1905, the England-based W. J. Jeffery Company introduced .404 Jeffery ammo, also known as .404 Jeffery Express, .404 Rimless Nitro Express and the 10.75 x 73 mm. It was originally developed as a powerful cartridge capable of dispatching big, dangerous African game such as elephants, buffalo, rhino, and the like. The cartridge did become quite popular on the dangerous game circuit in Africa. Today, the round remains a heavy hitter, using bullets in the 400 grain range with muzzle velocities above 2,000 feet per second and energies approaching 4500 foot pounds. There is even a 450 grain offering with superb sectional density launching at over 2100 feet per second - incredible performance! 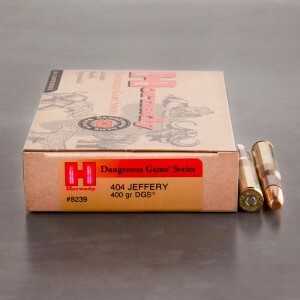 Of interest historically, when Remington wanted to make a big splash in the 30 caliber magnum race, it chose the .404 Jeffery as the parent cartridge for its immensely popular and powerful .300 Remington Ultra Mag offering - the most powerful 30 caliber magnum now produced. Remington also used the .404 Jeffery platform for its other popular ultra mag offerings as well as its short action ultra magnum stable. The .404 Jeffery is a superb cartridge for the world's largest game; in North America, it's up to the challenge for anything that walks the continent!